The audience was loud and boisterous. In fact, they were roaring drunk. It was 8:45 pm - after a long dinner - and I was the "motivational" speaker. It was the first day of a week-long conference for this small, strife-ridden, high-tech company. The day's meetings had ended at 4 p.m. and people adjourned to the bar. Then there was a social hour from 6 to 7 p.m. Afterward, four different kinds of wine were served with dinner. By the time I came on, the group was hurling insults at each other, at their competition and at me. It was just short of a food fight. So what did I do? Opened with my serious, thought-provoking Oliver Wendell Holmes quote, of course. One of the ringleaders in the back of the room slid down in his chair, rolled his eyes skyward and let out a loud groan. It went downhill from there. 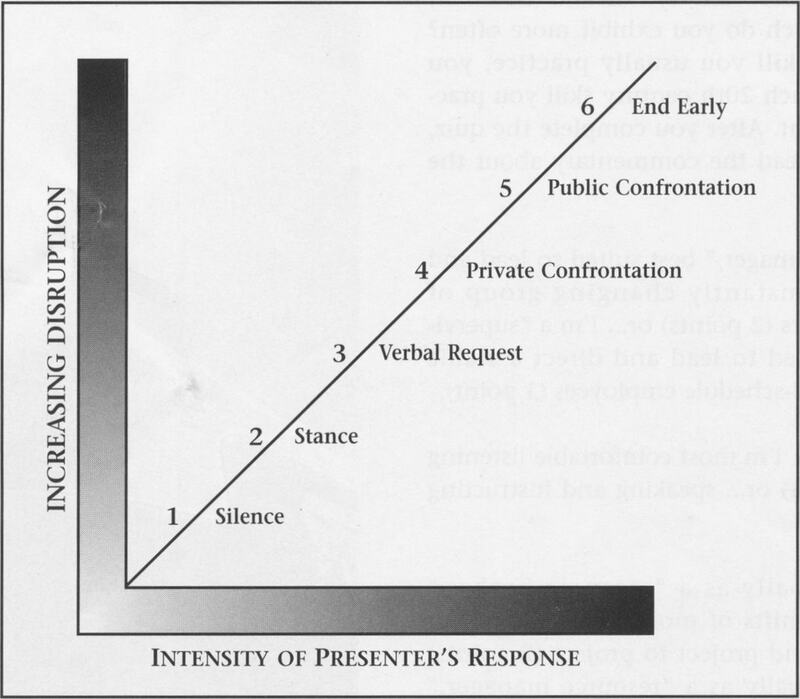 How does a presenter control disruptive audience behavior? What would you have done? You do not have to put up with rude audience behavior. Your audience wants you to take charge of inappropriate behavior and disruptive individuals. You can use a series of graduated responses to gain control. Stop talking. The unexpected silence from the front of the room will almost always bring attention back to you. Walk over and stand physically near the talkers. Stop the program briefly and ask the talkers to be quiet. Confront the disruptive people privately during a break and enlist their cooperation. Confront them publicly during the program and ask them to stop or to leave. Remember, you always have the final option of ending early if things get too far out of control. Even pros use this strategy. When Art Linkletter, recipient of Toastmasters' Golden Gavel Award in 1986, faced a drunken and indifferent audience, he asked himself these questions: 1.) Am I being paid? 2.) Do I ever want to come back? 3.) Do I care about anybody here? No. At this point he shortened his talk to about "35 words" and ended early. According to Linkletter, "You do not owe anything to an audience who won't give you the courtesy and respect of their attention." Amen. So, what would I do today if faced with the same drunken and disorderly audience? First, I would not attempt to give a serious, "motivational" presentation after dinner. After-dinner talks need to be short and funny. Failing that, I would follow Art Linkletter's advice and leave early. Next time you face a disruptive audience, remember not to let them spoil the show. You have a wide range of strategies for dealing with out-of-control audiences. These tactics will keep you in control. Your listeners will applaud you for it and you'll be one step closer to a more confident attitude toward speaking - even in the worst of conditions.